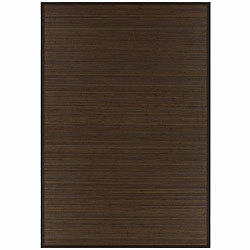 I love the color of this Hand woven Brown Rayon Bamboo Rug... I bought it for a back drop for a cow-hide rug I ordered, because the wall to wall carpet is tannish brownish shade, and I wanted the cow-hide rug to stand out... This Hand woven Brown Rayon Bamboo Rug does the job well. Update your modern living room with this rich hand-woven bamboo rug. Natural patterns in the wood create a unique one-of-kind piece filled with stunning visual interest, and the dark canvas border offers a clean, sophisticated appearance. 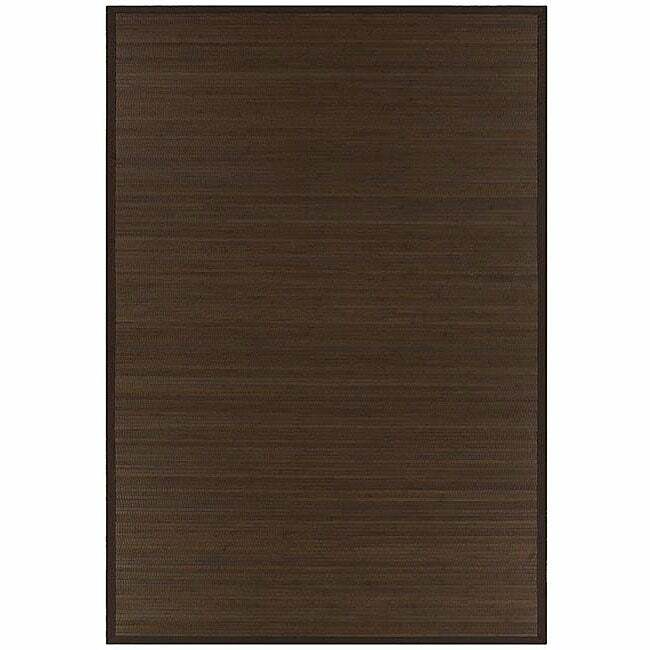 Underscore your taste in contemporary furniture by pairing the pieces with this minimalist rug. Natural bamboo construction combines your ecofriendly wishes with durability you can depend on. The canvas border protects against fraying, meaning you can place the rug in active areas. Sized for coverage, this beautiful area rug provides a gorgeous backdrop in your dining room. Rug looks good, but not as pictured. I "love" the rug on the pic and its dark rich color, but I only "like" the real item - as mentioned in other review, it is not dark enough, therefore disappointing. Since it was not packed well it came scratched, so I had to use a brown sharpie to make it less obvious. Rug seems to be of a nice quality, however it does scratch easily. For the price of $88 it is a great value and I am keeping it, but would not order it again, because of the way-off and lot lighter color than pictured and turtle shell-like pattern on bamboo slats. Here's to hoping it will last long and relatively unscratched under my dining table. nice rug, color not the best, just ok. I love bamboo rugs, they are so easy to care for. However, the color of this particular rug was disappointing. It looked like a nice dark chocolate online, but in person, it is not dark enough. But I am using it anyway, because I love these kind of rugs and it works pretty well in the room. The price is also very reasonable, considering I've seen these for much more. Got pets? Bamboo Rugs are the way to go! While this rug appeared to be nice quality and have a great appearance, my opinion quickly changed. The description claims the rug is durable, which it is definitely not. The bamboo slats popped and broke within one week of having the rug under my coffee table. It gets worse every time we step on it. This rug did not last one month, and probably won't see three. I would NOT recommend this rug! Initially I loved the look of this rug. Unfortunately it is very brittle and you can not have furniture on it. I found that company would move chairs forward, onto the rug, and then where the armchair legs rested on the rug it would break. Once the rug starts breaking you have splinters all over the place. One guest sat on our coffee table (?!?!) and cracked the rug in 4 places where the legs all met the rug. The bamboo rug is excellent quality. I love the color and backing and it was shipped quickly. I have bought a lot of bamboo rugs from overstock and I've been happy with them but this one has really poor staining it's very streaky plus one of the slats was too wide so whenever you walk on it a piece of it breaks off leaving white edge. Keeping only because hard to return. This rug is absolutely beautiful. We used it on top of the carpet, so it broke in a lot of places, and that's the only down side. If used on a hard surface, it would be perfect. I can't tell something about quality of a rug as still there is a packed. This my review about exceptional service of the Overstock. I ordered a rug on Tuesday during the lunchtime, and on Wednesday, having come from work, found it at the my door! Sometimes it seems that they use rockets for delivery of their goods. Bravo again! Nice sturdy rug. The only downer is that it scratches easily and is hard to hide because of the color. I'll need to find a solution to color in the scratches. Beautiful rug and perfect for the dining room with small children. Caution when placing heavy objects on top however. The wood breaks off eventually. It has lots of blemishes not very sturdy. Pro: nice color, easy to wipe down. Con: Very cheaply made, not at all durable. I barely walked on it and bits and pieces started breaking off after about two weeks. Would not recommend. This isn’t wasn’t what I was expecting.. it’s like Wood. Maybe I didn’t read the details well enough. Anyways we love it! Have it under the kitchen table. It’s nice because it vacuums well and I can wash it like the floors! Great looking as expected. Just way to big for the area I bought it for. Purchased approx. 4 years ago, still holding up great. Easy to clean with steam mop or Swiffer. "Is this product dark brown?"